Shift work has an important socioeconomic impact and is crucial to health-care delivery. However, shift work may increase the susceptibility of individuals to misalignment between the sleep/wake cycle of shift workers and their endogenous circadian rhythm. Shift work has also been linked to an increased risk of several adverse health outcomes such as cardiovascular disease, breast cancer, metabolic syndrome, gastrointestinal disease, menstrual irregularities, and psychological distress. Sleep quality is affected by shift work, and this effect may extend to the days following irregular working hours, leading to insomnia and sleepiness. Affected sleep quality may, in turn, result in sleep deprivation and cumulative sleep debt in shift workers; this effect may lead to impaired performance  and reduced psychomotor vigilance, therefore increasing the risk of work-related injuries. Night shift, in particular, may increase the risk of work-related accidents. In addition, several studies have linked mental health disorders such as depression and anxiety to shift work. No study has assessed the interaction between sleep quality, sleepiness, and depression among emergency physicians. Therefore, we conducted this study to assess sleep quality, daytime sleepiness, and depressive symptoms among emergency physicians. This cross-sectional case–control study was conducted between November 2015 and April 2016. Cases were randomly (simple random) chosen emergency physicians who have worked regularly in shift work for at least 3 months. Controls were randomly (simple random) chosen family medicine physicians who have a fixed daytime shift. The study took place in nine major hospitals in Riyadh, Saudi Arabia, including King Khalid University Hospital, King Faisal Specialist Hospital and Research Center, King Fahad Medical City, National Guard Hospital, Prince Sultan Military Medical City, King Saud Medical Complex, Imam Abdulrahman bin Faisal Hospital, King Salman Hospital, and Prince Mohammed bin Abdulaziz Hospital. The study was approved by the ethics committee at the College of Medicine, King Saud University, and informed consent was obtained from all participants. Data were collected via a self-administered questionnaire. English language was used, as all participants could read and understand English. The first part of the questionnaire has four segments: demographic data, a question about whether there was a previous diagnosis of depression or a sleep disorder and a question about whether the patient was on any medication at the time of filling the questionnaire. Three additional validated questionnaires were used to assess different aspects related to sleep quality, daytime sleepiness, and depression; the Epworth Sleepiness Scale (ESS), the Pittsburgh Sleep Quality Index (PSQI), and the Beck Depression Inventory (BDI). The ESS is a validated questionnaire used to assess the propensity to fall asleep during different daily situations. It consists of eight situations in which the participant is asked to fill in the chance of dozing in each situation during the month before filling the questionnaire. The score for each question ranges from 0 to 3 depending on the degree of probability of dozing, a total score ranges from 0 to 24 points. A total score of “10” or more indicates daytime sleepiness. The PSQI is used to measure the quality and pattern of sleep in adults. It consists of ten questions with a 7-component scoring system that measures subjective sleep quality, sleep latency, sleep duration, habitual sleep efficiency, sleep disturbances, use of sleep medications, and daytime dysfunction over the past month. Each item is weighted on a 0–3 interval scale. The PSQI score is then calculated by adding the seven component scores, providing an overall score ranging from 0 to 21, where lower scores denote a healthier sleep quality. A total score of “5” or higher is indicative of poor sleep quality. Data are shown as the mean ± standard deviation. The comparison of categorical variables between groups was performed with the Chi-square test. The comparison of continuous variables was performed with Student's t-test or Mann–Whitney U-test if the normality test failed. 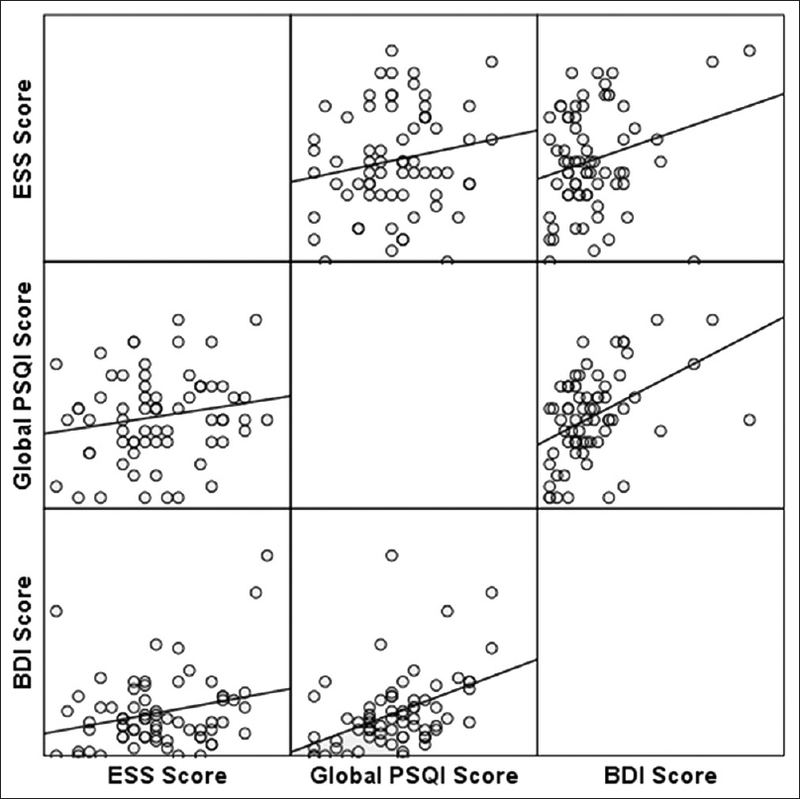 To explore correlations between the PSQI, ESS, and BDI scores, Pearson's correlation coefficient was used. P ≤ 0.05 was considered statistically significant. The data were analyzed using Statistical Package for the Social Sciences, IBM version 22 (SPSS Inc., Chicago, IL, USA) software. This study included a total of 137 participants divided into two groups (cases and controls). The emergency physicians' group (cases) comprised 68 participants. The control group comprised 69 family medicine physicians. The demographics of the two groups are shown in [Table 1]. There were no statistically significant differences in the demographics of the two groups apart from age, where the mean age of the emergency physicians' group was 35.2 years and the mean age for the control group participants was 40.4 years. There was a higher number of male participants in both groups, 48 male participants in the emergency physicians' group and 40 male participants in the control group, comprising 70.6% and 58%, respectively. The average number of shifts per month for emergency physicians was 4.9 ± 0.9. [Table 2] shows the comparison of the ESS, PSQI, and BDI scores between the two groups. 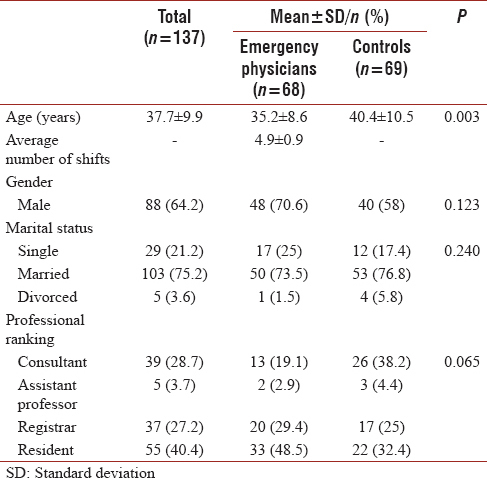 The mean total score of the ESS in the emergency physicians' group was 9.1 ± 4.6, which was significantly higher than that of the control group that has a mean ESS score of 6.1 ± 3.8 (P ≤ 0.001). Among the emergency physicians' group, 28 participants (41.2%) scored ≥10 on the ESS (indicating increased daytime sleepiness) and that was significantly higher than the control group in which only ten individuals (14.5%) scored ≥10 on the ESS (P ≤ 0.001). Mean total PSQI scores in the emergency physicians' group was 8.3 ± 4; it was significantly higher than the control group that has a mean score of 5.3 ± 3.2 (P< 0.001). The number of participants scoring ≥5 on the PSQI (indicating poor sleep quality) was significantly higher among emergency physicians' group than that of the control group, 57 (83.8%) and 35 participants (50.3%), respectively (P< 0.001). Although the scores of emergency physicians and controls were within normal range, emergency physicians had a significantly higher BDI score, which may reflect a higher tendency to develop depression. When using a cutoff value of <13 to define no depression, 59% (n = 40) were normal in the emergency physicians' group compared with 78% (n = 54) in the control group (P< 0.02). [Table 3] shows Pearson's correlation coefficient results between the ESS, PSQI, and BDI scores in the emergency physicians' group, and [Figure 1] shows a scatterplot between ESS, PSQI, and BDI scores in emergency physicians. 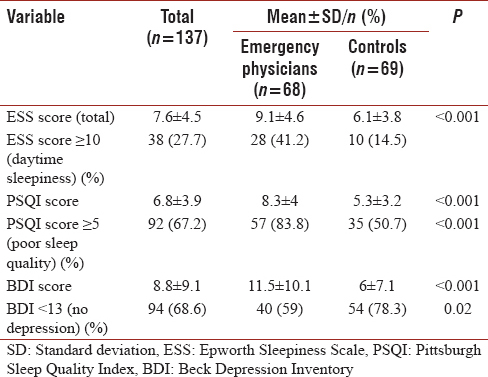 Using the Pearson's correlation coefficient, there was a strong correlation between emergency physicians with poor sleep quality (i.e., scores of ≥5 on PSQI) and depressive symptoms as assessed by the BDI scores (r = 0.437, P < 0.001). This study shows that emergency physicians have more sleep disturbances compared to controls (physicians without shift work). The majority of emergency physicians (83.8%) had poor sleep quality (a score ≥5) on the PSQI. Previous studies have shown that shift workers, in general, have poor sleep quality compared to controls. A prior study by AlMetrek in factory workers in Aseer region, Saudi Arabia, demonstrated a higher percentage of poor sleep quality among shift workers when compared to nonshift workers. Furthermore, our findings concur with a recent study conducted among health-care professionals, which revealed that shift workers had higher PSQI global scores and higher ESS scores in comparison to nonshift workers. Shift work is considered an important factor that affects performance and safety. There is an increased risk of accidents among shift workers,, with subsequent significant socioeconomic costs. Akerstedt et al. showed that self-reported disturbed sleep predicts accidental death at work, even when controlling for stress and physical workload. Similarly, a study by Barger et al. demonstrated an increased risk of motor vehicle accidents in interns with extended-duration work shifts. On the other hand, it has been shown that improving resting conditions for interns with extended work shifts resulted in improved sleep and significantly decreased medical mistakes. In this study, the high percentage of poor sleep quality among emergency physicians demonstrates the importance of implementing practical countermeasures that may improve sleep and alertness among emergency physicians to avoid mistakes that may accompany poor sleep. The American College of Emergency Physicians (ACEP) considers shift work as an important area that may affect emergency physicians' well-being. In addition, the ACEP indicates that patients are served better when emergency physicians practice in a supportive environment. Disturbances of sleep and circadian rhythm that occur in shift workers may increase the risk of depression. A recent systematic review demonstrated that nighttime shift work (outside health sector) does increase the risk of depression. In general, longitudinal studies that assessed depression among shift workers in a wide variety of occupations reported an increased risk of depressive disorders in some subgroups over an extended observation period (more than 4 years). In a recent integrative review that critically evaluated the impact of shift work on the psychological functioning and resilience of nurses demonstrated lack of longitudinal studies in health-care shift workers. However, the review concluded that for some nurses, shift work is associated with negative psychological outcomes and these outcomes appear highly dependent on contextual and individual factors. No studies have adequately assessed depression in emergency physicians. In our study, although both emergency physicians and controls have normal BDI scores, the score of the emergency physicians was significantly higher than that of the controls, which may reflect a tendency to develop depression. In addition, the percentage of emergency physicians with a BDI score <13 was significantly lower than that in the controls. To recognize the impact of shift work on the psychological functioning of emergency physicians, future studies should apply longitudinal designs. Several coping strategies have been described to prevent fatigue and insomnia among shift workers. These strategies may include scheduled napping, exposure to light at work, and special nutrition guidelines such as taking caffeine, especially at the start of a night shift., Scheduled short napping which minimizes sleep inertia has generally been shown to be helpful. Bright light is a promising effective method to reduce both fatigue and insomnia. However, there is still a lack of standardized recommendations for light therapy. It is proposed that effective use of light may result in an adaptation to the extended night shift period and enhance the subsequent readaptation to daytime activities. The ACEP suggested some solutions to ameliorate the impact of night shifts on physicians. Whenever possible, shift schedules should be in a manner consistent with circadian principles that rotate in a clockwise manner (day to evening to night). In addition, when possible, long shifts on consecutive nights should be avoided. Moreover, the ACEP recommends scheduling isolated night shifts or relatively long sequences of night shifts, and it also advocates that shift duration should be no longer than 12 h, there should be regular scheduling of at least 24 h off-duty and a place must be provided to sleep before driving home after night shifts. Future call schedules should consider the total number of hours worked by each physician and the intervals of time off between shifts. To modify the circadian rhythm and adapt to the new shift, the ACEP stresses that physicians should have regularly scheduled periods of at least 24 h off work. Night shift workers' schedules need to be meticulously designed to provide for planned sleep periods. A critical point that needs clear attention of emergency physicians and the management of emergency departments is providing a place to sleep before driving home after night shifts. This study has a few limitations. First, the proportion of male participants is higher than female participants. Thus, the results cannot be generalizable to both sexes. Second, the number of participants in both groups was relatively small. Nevertheless, the findings may simulate a larger national study to assess the impact of shift work on emergency physicians. Third, shift time and frequency were not accounted for in the questionnaire, which are parameters that may affect the degree of sleep deprivation and its consequences. Shift work is an integral part of health-care systems. This study considered the association between shift work among emergency physicians and sleep quality, daytime sleepiness, and depressive symptoms. Daytime sleepiness was noted in both groups; however, it was significantly higher in emergency physicians. Furthermore, poor sleep quality was apparent among emergency physicians. Emergency physicians suffering from poor sleep quality had significant depressive symptoms, warranting counseling regarding sleep and the possible need for a psychiatrist's and sleep medicine physician's evaluation. Longitudinal studies are needed to consider shift work impact on health-care professionals and strategies to mitigate its negative effects. This study was supported by a grant from the Strategic Technologies Program of the National Plan for Sciences and Technology and Innovation in the Kingdom of Saudi Arabia (08-MED511-02). Office of Technology Assessment. Biological Rhythms – Implications for the Worker: New Developments in Neuroscience. University Press of the Pacific; 2005. Boivin DB, Boudreau P. Impacts of shift work on sleep and circadian rhythms. Pathol Biol (Paris) 2014;62:292-301. Karlsson BH, Knutsson AK, Lindahl BO, Alfredsson LS. Metabolic disturbances in male workers with rotating three-shift work. Results of the WOLF study. Int Arch Occup Environ Health 2003;76:424-30. Schernhammer ES, Kroenke CH, Laden F, Hankinson SE. Night work and risk of breast cancer. Epidemiology 2006;17:108-11. Biggi N, Consonni D, Galluzzo V, Sogliani M, Costa G. Metabolic syndrome in permanent night workers. Chronobiol Int 2008;25:443-54. Labyak S, Lava S, Turek F, Zee P. Effects of shiftwork on sleep and menstrual function in nurses. Health Care Women Int 2002;23:703-14. Shields M. Shift work and health. Health Rep 2002;13:11-33. Škerstedt T. Shift work and disturbed sleep/wakefulness. Sleep Med Rev 1998;2:117-28. Elmenhorst D, Elmenhorst EM, Luks N, Maass H, Mueller EW, Vejvoda M, et al. Performance impairment during four days partial sleep deprivation compared with the acute effects of alcohol and hypoxia. Sleep Med 2009;10:189-97. Zhou X, Ferguson SA, Matthews RW, Sargent C, Darwent D, Kennaway DJ, et al. Mismatch between subjective alertness and objective performance under sleep restriction is greatest during the biological night. J Sleep Res 2012;21:40-9. Uehli K, Miedinger D, Bingisser R, Dürr S, Holsboer-Trachsler E, Maier S, et al. Sleep quality and the risk of work injury: A Swiss case-control study. J Sleep Res 2014;23:545-53. Swanson LM, Arnedt JT, Rosekind MR, Belenky G, Balkin TJ, Drake C, et al. Sleep disorders and work performance: Findings from the 2008 national sleep foundation sleep in America poll. J Sleep Res 2011;20:487-94. American College of Emergency Physicians. Emergency Physician Shift Work 2017; Available from: https://www.acep.org/Clinical-–Practice-Management/Emergency-Physician-Shift-Work/#sm. 0000pm567judad49xid2h9o279wa1. [Last accessed on 2018 Jan 10]. Arnau RC, Meagher MW, Norris MP, Bramson R. Psychometric evaluation of the beck depression inventory-II with primary care medical patients. Health Psychol 2001;20:112-9. Almetrek M. Effect of shift-work on sleeping quality of male factory workers in Saudi Arabia. Natl J Physiol Pharm Pharmacol 2014;4:61-8. Alshahrani SM, Baqays AA, Alenazi AA, AlAngari AM, AlHadi AN. Impact of shift work on sleep and daytime performance among health care professionals. Saudi Med J 2017;38:846-51. Folkard S, Lombardi DA, Tucker PT. Shiftwork: Safety, sleepiness and sleep. Ind Health 2005;43:20-3. Spurgeon A, Cooper CL. Working Time, Health and Performance. In: WellBeing in Organizations, Cooper C, Robertson I, editors. London; 2001. p. 91-124. ISBN: 0471495581. Leger D. The cost of sleep-related accidents: A report for the national commission on sleep disorders research. Sleep 1994;17:84-93. Barger LK, Cade BE, Ayas NT, Cronin JW, Rosner B, Speizer FE, et al. Extended work shifts and the risk of motor vehicle crashes among interns. N Engl J Med 2005;352:125-34. Angerer P, Schmook R, Elfantel I, Li J. Night work and the risk of depression. Dtsch Arztebl Int 2017;114:404-11. Tahghighi M, Rees CS, Brown JA, Breen LJ, Hegney D. What is the impact of shift work on the psychological functioning and resilience of nurses? An integrative review. J Adv Nurs 2017;73:2065-83. Ker K, Edwards PJ, Felix LM, Blackhall K, Roberts I. Caffeine for the prevention of injuries and errors in shift workers. Cochrane Database Syst Rev 2010:CD008508. Richter K, Acker J, Adam S, Niklewski G. Prevention of fatigue and insomnia in shift workers-a review of non-pharmacological measures. EPMA J 2016;7:16. Rajaratnam SM, Howard ME, Grunstein RR. Sleep loss and circadian disruption in shift work: Health burden and management. Med J Aust 2013;199:S11-5. Iwata N, Ichii S, Egashira K. Effects of bright artificial light on subjective mood of shift work nurses. Ind Health 1997;35:41-7.